It has been a while since I wrote about things that make me happy – it has nothing to do with NOT being happy – just trying to heal myself psychologically and emotionally so that I can get back to where I used to be. I used to LOVE going out and working on plants and gardening….used to LOVE going shopping and not really buy anything….LOVE taking pictures of nature….LOVE having people over for dinner and just fun…but for years now I barely answer the phone to talk to anyone (including family and friends) – I hide in my little computer room and that is it. Slowly lately I have been working on creations and moving forward…little tiny baby steps…small improvements – and it feels good right now—then about 4 weeks ago – my son and his wife (he is stationed in Japan) had a baby girl….her name is Savannah Marie….My daughter in law already has a toddler from another relationship – so I am a GRANDMOTHER – and that makes me HAPPY – actually ecstatic!!!! 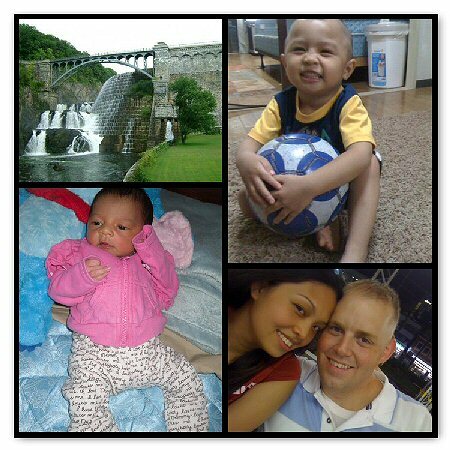 The picture above is of my son and his wife and “D” their toddler and the new sweetie Savannah – he has received new orders to be stationed in Georgia – only about 6-8 hours away – we are thrilled – they come home Sept 9th so we are just soo00 excited!!! For now that is what makes me HAPPY!!! The picture of the dam is from a high school friend who took the pic of the dam in our town – i have such awesome memories of the dam – so I was thrilled to receive this pic. Again – makes me beyond HAPPY!! I hope you are HAPPY and Thanks for stopping by!! !